The Super Dollar Authenticator by AccuBanker is compact, fast, and reliable. The D500 immediately verifies the authenticity of U.S. currency and its denomination. Extremely user friendly and accurate, this model is truly a versatile component to any business. An audible and visual warning alerts you when a suspicious bill is detected. 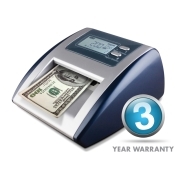 It also includes an AccuBanker 3 year warranty!